The Contraband Camps described in Part 1 and Part 2 grew even larger after Abraham Lincoln issued the Emancipation Proclamation on January 1, 1863. The draft of the Emancipation Proclamation that was issued in the fall of 1862 did not include the provisions for the recruitment of African Americans into the military. Abraham Lincoln at first was not convinced of the necessity for black troops. The exodus from the plantations resulted in an excess of fugitive slaves within Union lines. This fact coupled with the shortage of white Union manpower led to Lincoln’s decision to encourage the exodus further and put the refugees to work in the Union army. 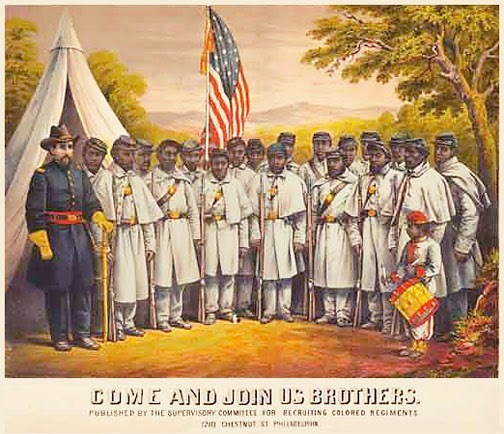 The United States War Department issued General Order Number 143 on May 22, 1863, establishing the Bureau of Colored Troops to facilitate the recruitment of African-American soldiers to fight for the Union Army. Regiments, including infantry, cavalry, engineers, light artillery, and heavy artillery units, were recruited from all states of the Union and became known as the United States Colored Troops (USCT). Historian Steven Hahn proposes that when slaves organized themselves and worked with the Union Army during the American Civil War, including as some regiments of the USCT, their actions comprised a slave rebellion that dwarfed all others. The numbers of troops recruited in the south came primarily from the contraband camps. One exception is Texas as there was not a strong Union presence in Texas until the end of the war. The soldiers are classified by the state where they were enrolled; Northern states often sent agents to enroll ex-slaves from the South. Note that many soldiers from Delaware, DC, Kentucky, Missouri and West Virginia were ex-slaves as well. GENERAL AFFIDAVIT State of Mississippi, County of Adams: In the matter of Pension claim of Eliza Davis now Mackel, late widow of Wm. Davis, late Co. H. 63rd USCT. I am a minister of the gospel and have been for 45 years and I joined in the Holy Bonds of Matrimony one Eliza Davis and Lewis Mackel at the Morgan plantation in Concordia Parish, Louisiana on the 7th day of November 1869 and I know the said Eliza Davis to be the widow of the above named soldier William Davis who is now dead. Signed- William Shorter.